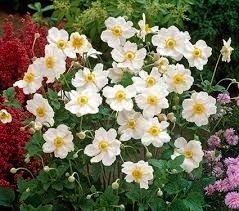 And the winner is … Anemone Honorine Jobert! Bobbing 3-4 feet above the neat 12-inch mound of foliage, this superb cutflower is also a garden standout, adding a lightness to the perennial border. They begin blooming in late summer, just when colorful displays of most other perennials have left the landscape, and continue well into fall. Multitudes of big, bold, bright white, yellow centered flowers are beautiful in borders, cottage gardens, woodland gardens and very showy in mass plantings. Ideal for the garden or the vase, Honorine Jobert performs best in rich organic soil kept consistently moist. A charming and prolific shade or part sun garden performer it is hardy to Zone 4 and is an attractive companion to astilbes and hostas. The Perennial Plant of the Year showcases a perennial that is a standout among its competitors. 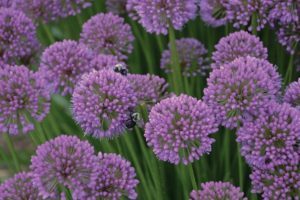 Perennials chosen are suitable for a wide range of growing climates, require low maintenance, have multiple-season interest, and are relatively pest/disease-free. If you are looking for an excellent perennial for your next landscape project or something reliable for your gardens, make sure to check out the Perennial Plant of the Year™ archive list. At Miracle Farms we often rely on the list of past Perennial of the Year winners to be reliable bloomers year after year.